Western, eastern, continental, handshake or the hammer grip? What is the right way of holding a tennis racket? If your answer is none of the above than you are probably right. The western, eastern and continental way of holding a racket are just orientation points. In reality every tennis player adjusts the way he holds the tennis racket to his way of playing and what feels natural to him. Even though for beginning players this can be a way of starting out – by using one of the standard grips, there is still a better way for it then by calling it names and trying to memorize it by names. I am playing tennis for more than 20 years now and I have given more than 10,000 lessons and I still do not know which one is the western, eastern or continental grip J This is because I never found it useful. Just like nobody has taught me by using the names of the grips, I will also not scream on the court – western or eastern because after 15 minutes of playing I will find out that what I initially have shown a player to be the western grip has over the 15 minutes of play became a continental without him even noticing the difference. 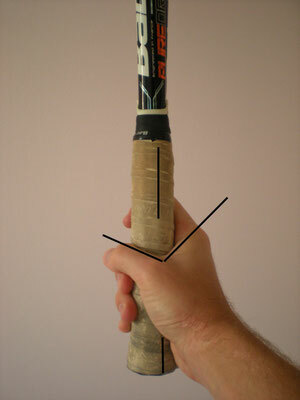 The handshake grip (you take a racket with your left hand and you give it a handshake with your right hand – for a forehand grip) is a bit better than the ”call-it-names” method, but in my eyes also not very practical, because the adjustment (or getting your hand in the right position) requires letting go of the racket. What I find the best way is the V approach. It works for all grips and for all strokes in tennis, it is easy and you can check and adjust it quickly without letting the racket go. The V shape is created by two fingers on your hand – the thumb and your index finger – as they connect they resemble a letter V. The lowest point of the V is your orientation point. If you place this lowest point of the V on the right top edge of the racket you have a perfect starting grip for forehand (western grip by the way – as I just learned on the internet J). 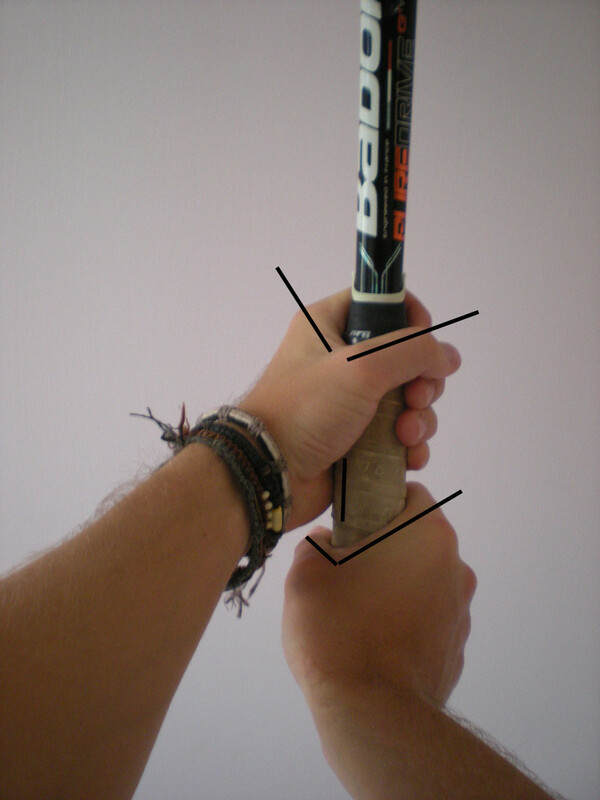 I find this a good method because during the play or training exercises you can always check the grip just by looking at it and by slight rotation of your hand you can come to the right position again when it is off. You don’t need to feel anything, you don’t need to let the racket go, you don’t need to remember no names. 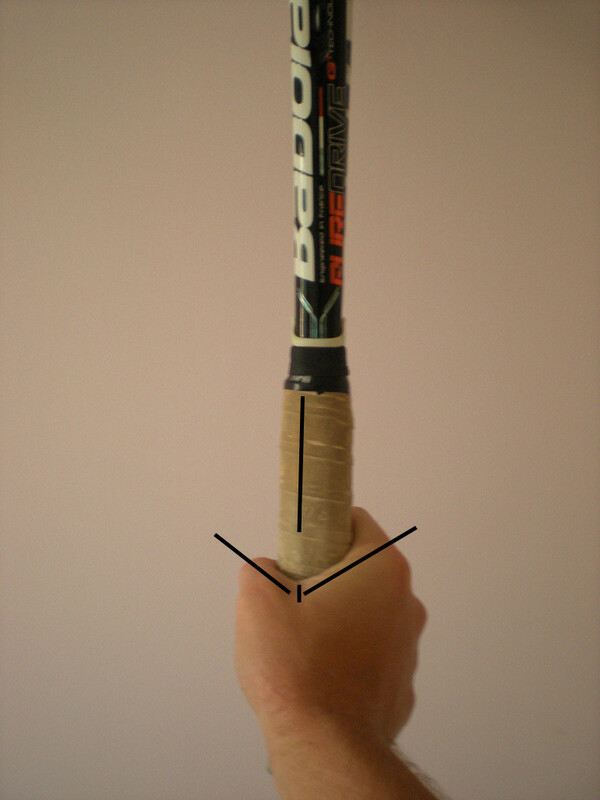 For the Backhand, for starting tennis players I use the grip where the V of the right hand goes in between the two edges on the left top side of the grip. The left hand’s V is aligned with the right hand’s V. For one handed backhand I place the V not on the left top edge but on the second left edge (right below the top left edge - more to the left). For serve I use neutral grip (hammer grip) where the V is on the left top edge of the racket. 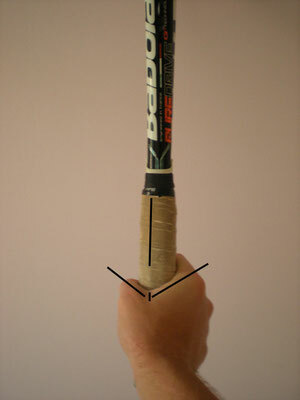 The same grip I use to teach volleys (forehand and backhand) and backhand slice. As I said in the beginning of this article, there is no right way of holding the racket. Every player adjusts the grip based on his game and the feeling he gets from the grip. The grips I mentioned here are just starting points. So If it doesn’t feel natural feel free to rotate the hand a bit until it feels natural and the balls goes in the court. Also to note, the adjustments to the grip are always very drastic changes in one’s game. 1 mm shift in the grip results in 1m ball trajectory difference (or more). So before changing a grip try to look at the wrist angle first, or the way you hit the ball. During the organization individuals for the most part recognize each supplementary along with they are very much responsive of their rival's shortcomings. I resolve attempt to have fun the same number of sphere through his strike and abstain from in performance to his forehand. Amid the association people generally perceive each supplementary alongside they are especially responsive of their opponent's inadequacies. I settle endeavor to have a fabulous time a similar number of circle through his strike and go without in execution to his forehand. I remain new to this site. This is an astoundingly informative article. I am believing a comparable best work from you later on as well. I am grateful to you for offering this brilliant article to this pleasing data.